Zamudio will reduce to a minimum the amount of waste derived from celebrations and will work to introduce in them reusable tableware or, at worst, compostable elements. As a step forward towards its goal of a ‘Zero Waste’ municipality, and in the context of the Waste4Think project, the local council of Zamudio will continue to make a bet for environmental consciousness in all mass lunches and festivals. It will therefore work to reduce to a minimum the amount of waste that is generated in them, and it will encourage the use of reusable tableware or, at worst, of compostable elements. 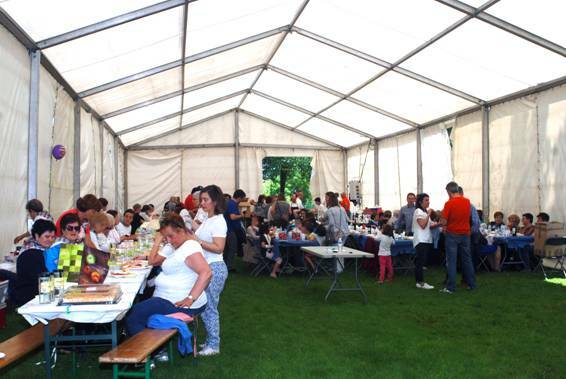 Thus, the local council will spread this line of work to all festivals in the municipality, after the pilot experience in June last year during the mass lunch of Lagatzu Alkartea was an overwhelming success (90,98% of waste was reused through compost) and the initiative in this year’s Pazko Jaiak received a warm welcome. From now onwards, the goal will be to turn every festival into an “eco-event”, that is, celebrations where waste prevention will be a must. Prevention will indeed be especially highlighted both in the case of waste from packagings and from food waste, and care will be taken that food remainders are distributed amongst participants or given to people in need. In the case of waste that cannot be prevented, separate waste collection will be encouraged, especially in the case of waste that can be easily reused through composting. In this line of work, festivals held in Zamudio will promote the use of china and glass tableware, which prevent waste generation, and the use of tap water to prevent buying water bottles and the issuing of packaging waste. In the cases where the use of reusable crockery is not possible, the use of compostable elements will be encouraged, and the local council will distribute this kind of tableware amongst ‘txosnas’ and the people in charge of organizing different events. Apart from promoting waste reduction in the municipality, this common work is an opportunity to support social transformation, and to favour the environment, beyond Zamudio. This entry was posted in news, Uncategorized, Zamudio. Bookmark the permalink.